Hello. I am Steven Christenson. I have enjoyed a few moments of fame for my photography of the night sky – in fact you may have seen me on KQED or ABC7 in the San Francisco Area. I have astronomer’s blood coursing through me with more than a touch of tech-geek mixed in. My passion is photography in the dark of night where distant glowing orbs of superheated gases are the literal stars of my images. 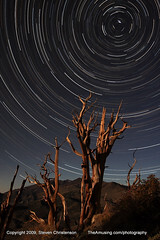 Though I am an astro-photographer by definition of the word my goal is to capture the heavens and earth together using modest equipment: a digital SLR camera, a sturdy tripod, a wide angle lens, a timer, patience and a smidgen of digital know-how. My endeavors make me a slave to the whims of terrestrial and celestial weather. 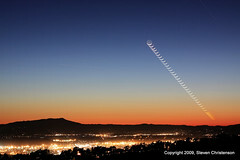 I arrange my vacations around moon phases so I can make the most of clear skies and nearly moonless nights. 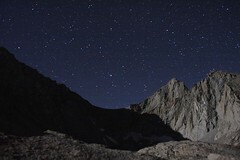 My motto is “Have camera: will hike for photos” especially if that means conquering a mountain in the dark. 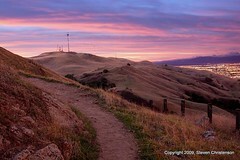 My favorite mountain is Mission Peak. It is conveniently located just a few miles from my day job in the South San Francisco Bay. It is difficult to describe the away-from-it-all feeling I enjoy after a challenging hike to 2,517 feet at a pinnacle well above the Silicon Valley hustle. 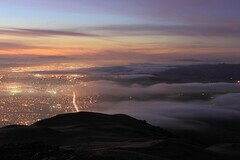 I fondly remember one pre-dawn hike where my upward assault of the mountain through a dense marine layer led me above the clouds which muffled the city lights. 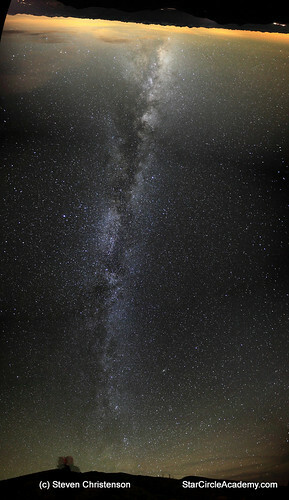 With the city lights vanquished the sky was so dark that the Milky Way shone as clearly as it ever can in this area. Sadly I didn’t stop to take a picture until sunrise! 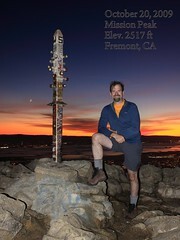 And perhaps better still I leave the office and go straight to the trail head so I can labor to reach the summit in time to drink in the often spectacular sunset. As a bonus, I hike down as the stars are shining, and the fog rolls in. 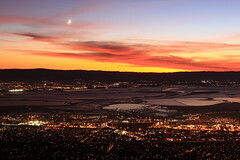 The cities ringing the San Francisco Bay have a cheery glowing charm, but that cheery glow also blots out many stars. I employ a simple scheme to keep the unnatural glow manageable – I make short exposures and I take many of them. 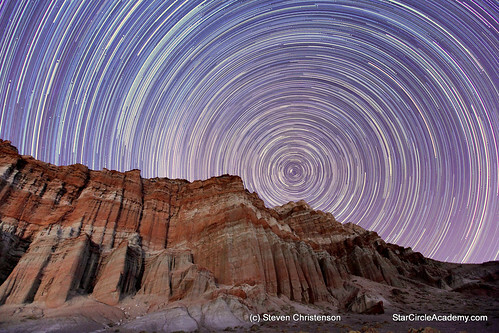 Each exposure is as little as 30 seconds when the sky is bright or as long as 8 minutes in a dark sky. 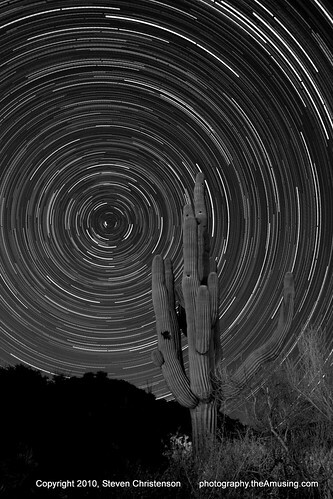 Then I combine the exposures using a process called brightness stacking. 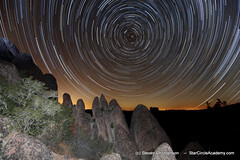 When combined, the images plot out the course of the stars or the moon through the minutes or hours of exposures. Despite diligent planning I am often surprised by what the camera captures. No unaided human eye can clearly see the dazzling true colors of the stars: yellow, orange, red, bronze, gold, blue and white. And a human eye cannot make out detail in the inky darkness – but the camera can. When the camera is pointed north the earth’s rotation causes the constellations of Ursa Major, Draco and Cassiopeia to appear to circle around Polaris, the North Star. 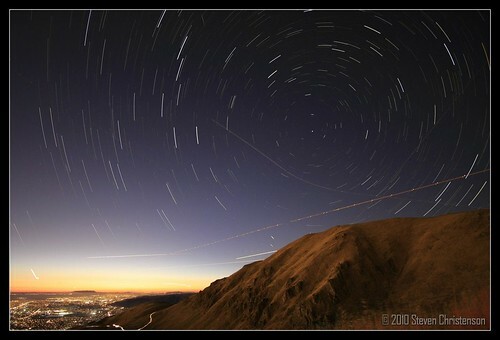 When the camera is pointed East or West, the stars trace diagonal lines which curve to the left or right. 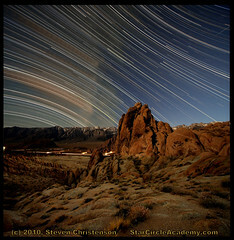 When pointed south, the stars form rainbow-like arcs over the terrain. Knowing the flight of the stars helps me plan my shots. 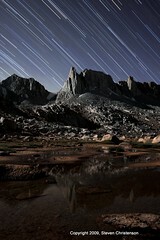 I study the terrain and trails to find locations where I can get an appealing foreground against a starry sky. My camera’s field of view is not always wide enough to capture everything, however, so I sometimes combine (stitch) an upper and a lower portion of a scene. While standing at Grand View Vista high in the White Mountains with my friend Harold Davis, the Milky Way stretched over our heads from horizon to horizon. It took 8 shots to capture it all. 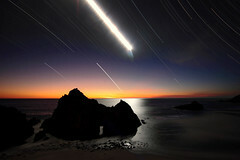 Late one afternoon it was my goal to capture stars in the night sky above Big Sur. 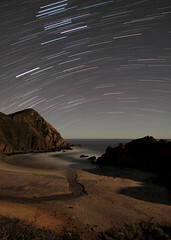 I lead a small cadre of night photographers from the Bay Area to Pfeiffer Beach where a large portal in the rock is the star attraction during the winter solstice. 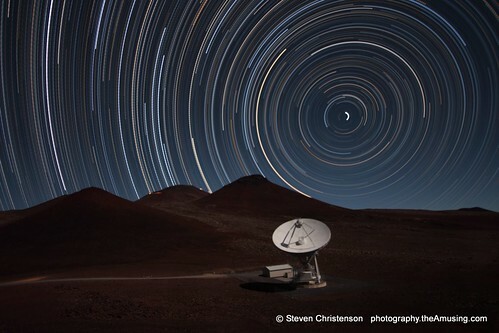 The image I got there – which is a combination of 3 separate images to control the huge differences in light – won me the honor of Astronomy Photographer of the Year, 2010 from the Royal Observatory, Greenwich, England. But I am just as thrilled with the images my camera captured after my award winning image. One of them features the moon and stars relentlessly heading west to dip below the Pacific. And another features the constellation Orion and the bright star Sirius streaking into the southern sky over a serene sandy cove. 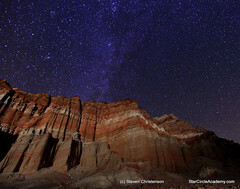 Though I prefer to stay and enjoy the night sky sometimes park hours prevent me from remaining vigilant over my camera. My solution is to leave my camera unattended to work though the night for me while I sleep and return when the park reopens. and to the wastelands at Red Rock Canyon State Park. to the remote desert floor of the Racetrack with mysterious moving rocks in Death Valley. 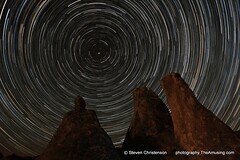 I have traveled to Arizona and Hawaii and farther to capture iconic foregrounds and seldom seen views. 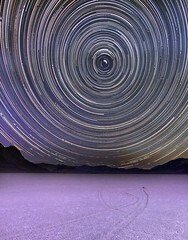 All for the purpose of seeing the world and the starry sky in a way that takes patience to appreciate. It saddens me that so few urban dwellers have ever seen the wonder of the Milky Way, or the natural fireworks of a meteor shower. I am rapturously married to tricia, a woman who not only understands my passion but who actively supports me. Wayne Freedman, of ABC 7 news called me “a man who turns darkness into light.” In fact I am a man seeking light in the darkness. It thrills me to find that light and share the wonder of it as best I can through my photos and in teaching and leading workshops and night sky adventurers. So there you go, that’s who I am. Glad to meet you! Oh, forgot to mention, you can find me on Facebook, Star Circle Academy on Facebook, and Star Circle Academy on Twitter. 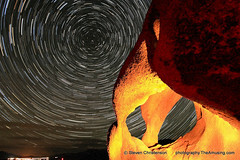 This entry was posted in Photo Tip, Ravings, Travel on May 18, 2011 by Steven Christenson. PERFECT,WHICH CAMERA IS BETTER TO DO THIS PHOTOS,THE CANON EOS 50D OR NIKON D90? YOU CAN SEE MY PICTURES IN FLICKR,MY NAME IS “PHOTODENIA”. 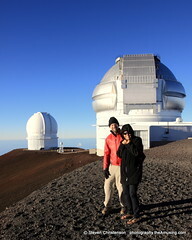 did you encounter any issues w/ lens condensation atop mauna kea? If so, any advice for addressing that would be appreciated. I’ve been up there a few times before, but many years ago. Chas: There are several ways to get to the summit including using an appropriate 4×4 (Jeep) rental, or with a tour group. I’m not comfortable making any specific recommendations because altitude sickness, lack of preparation, weather conditions, or proper mountain road driving experience could add up to serious injury or death – and I don’t want to hear from your attorney! Moreover the policies of the Univ. of Hawaii may change as to what they permit. 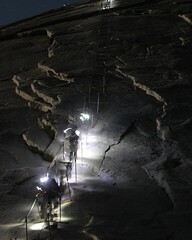 Do know that there are areas sacred to the Hawaiians as well as many places with protected habitats. For condensation issues/dew search for DEW or CONDENSATION (or click the cloud tags) and you’ll find lots of help. Interesting and fun. Steven gave a great talk. Looking forward to more events. It was very nicely run and well organized. Steven knows the subject very well and is a wealth of knowledge. Great seminar and superb leader. Funny, Informative, friendly and great photographer. A fun and very informative meetup. The organizer were super friendly and certainly knew what they were talking about. Thanks a lot. This was an excellent workshop. The content was sufficient to get me interested in the topic and have me do some research on my own. The sample pictures were great, and the Steven is an excellent presenter. Excellent presentation, got great ideas and inspiration! While looking up star charts to work on a side project of mine, I stumbled across your pictures. Left in awestruck I knew that this could only come from a someone who loves the gemmis in caelis as much as I. Alas, living in and around a highly populated area I have had to learn how to spot the constellations with very little guiding points. I have to say that your pictures are no less then pulchritudinem in essential, thank you for sharing them with the world. Praebere spes in timore ignotum, est humanitas. Verrückte Leute schreiben in Latein. Und verrückter Leute noch lesen! Glaubst du, ich spinne?